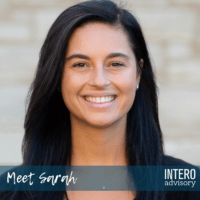 Sarah is our newest team member at Intero Advisory. A business major with English and marketing minors from Washington College, Sarah has a passion for writing and creativity. Sarah loves clothing and catching up on the latest trends in fashion. She applies her creative spirit and her keen eye for detail to her writing and marketing tactics, always trying to find ways to take things to the next level. We interviewed Sarah so that you could learn more about her! What are you currently working on at Intero Advisory? I’m currently working on content for in:side, our new membership site. When I’m not building out in:side, I’m writing LinkedIn profiles and blog posts. I like to be learning and contributing so I’m ready to jump in whenever I’m needed. How would you explain your job to a child? We work on the internet and help people look good, meet new people and tell stories. What are you known for? My clothes! I have quite a lot of clothes, and my friends are notorious for dipping into my closet for something to wear on the weekends. What would your last meal be? Probably a dozen donuts. Seriously. I love them. If you won the lottery what would you do with your money? Start my own clothing company! I don’t know what the details are yet, but I think it would be amazing to create something myself. What’s one thing you wish people understood about your job? How changing how you show up on LinkedIn can make a huge difference in how others see you! LinkedIn has a TON of value that can be tapped into for different purposes. People don’t really understand that you can use LinkedIn to increase revenue and build businesses. It’s crazy. I’m glad we’re here to show you how to optimize and use it properly (among other things). As we continue to highlight our team, we invite you to connect with us on LinkedIn and say hello. If you missed last week’s employee spotlight, we featured Jameison Hyson.